Follow the narrow winding footpath from the square and you will reach the welcoming doors of Mansion Kyani. This historic Mansion, originally home of a wealthy local wine merchant, is situated on a hill top overlooking the vineyards and quant village of Megalochori, with the sparkling Aegean in the distance. The mansion affords two living areas, which are connected by an exterior stone flight of stairs. On the ground floor a barn-door leads you into a compact kitchenette. An archway leads you into the magnificent master bedroom with domed ceiling. The extravagant en-suite bathroom features a large bath and separate shower. From the courtyard, a separate entrance with original wooden doors lead into the comfortable second bedroom which also features a dedicated elegant second bathroom. The first floor of this Mansion offers large terraces with panoramic views of the surrounding area which are perfect for alfresco dining on the stylish outdoors furniture. The original wooden floors of the first floor have been restored and the many windows allows for a bright and airy feel to the interior. 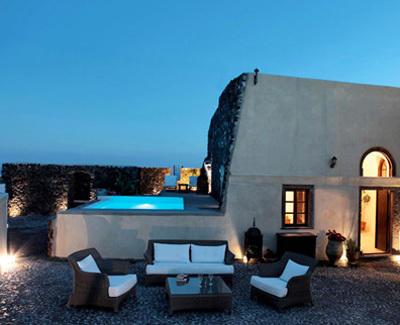 The comfortable double bedroom boasts views overlooking the vineyards to one side and the Aegean to the other. A dressing room leads into the spacious bathroom and separate restroom. The cleverly designed open-plan kitchenette and living area allows for casual entertaining. This Villa can accommodate up to 6/8 guests. Mansion Kyani provides a perfect base for those wanting to experience the many rhythms of the island.